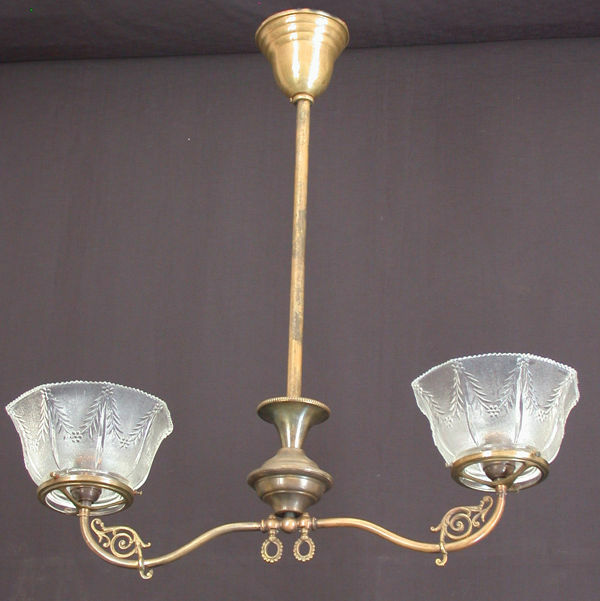 Item# GEJ 09203 This two light gas/electric J fixture has been fitted for electricity. 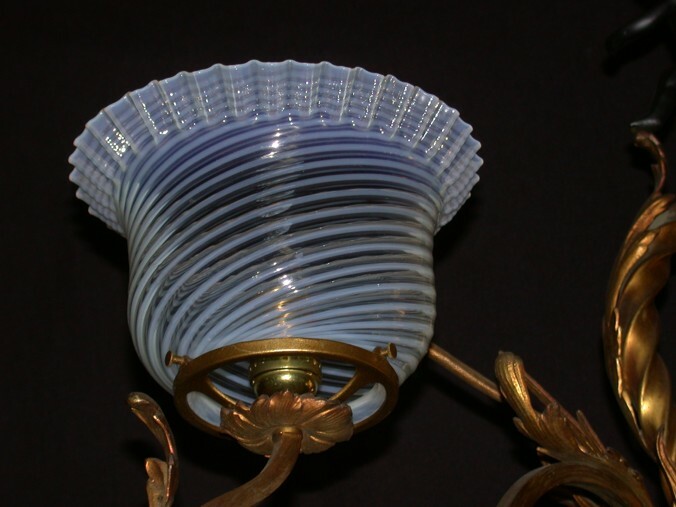 It is shown here with period blue pressed opalescent shades. Close-up images of shades available here. Laurel Swag and Bows patterned circa 1908. The shades can be seen in close up by following this link. The drop is presently, 38 inches. The spread is 17 inches. As shown this J and shades are available for $795.00 plus shipping. Questions? To order email or call. 905-885-2344. 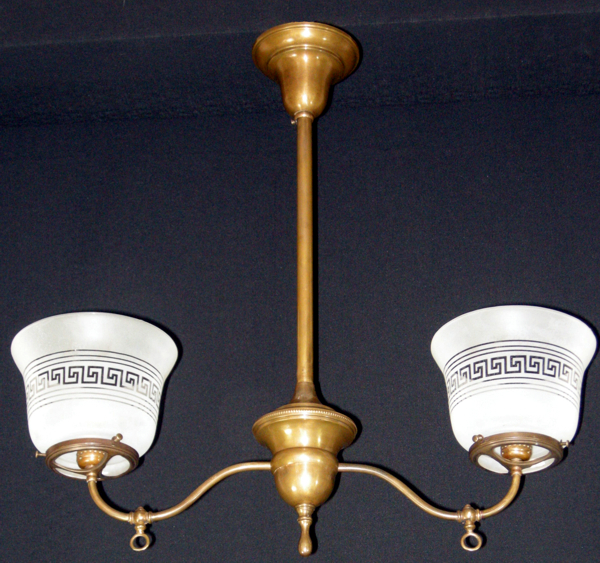 Item# GEJ 09203 This two light gas/electric J fixture has been fitted for electricity. It is shown here with Greek Key patterned shades. The drop is presently 38 inches. The spread is 16 inches. 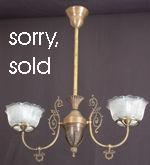 As shown with this shade choice the fixture is available for $395.00 Questions? To order email or call. 905-885-2344. Item# GEJ 09202 On Hold! 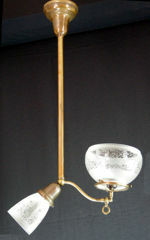 This two light gas/electric J fixture has been fitted for electricity. 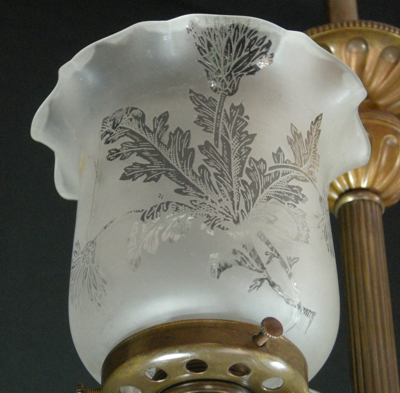 It is shown here with Etched signed Vianne shades. The drop is presently 31 inches. The spread is 16 inches. 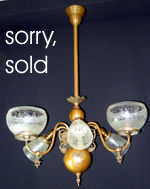 As shown with this shade choice the fixture is available for $425.00 Questions? To order email or call. 905-885-2344. 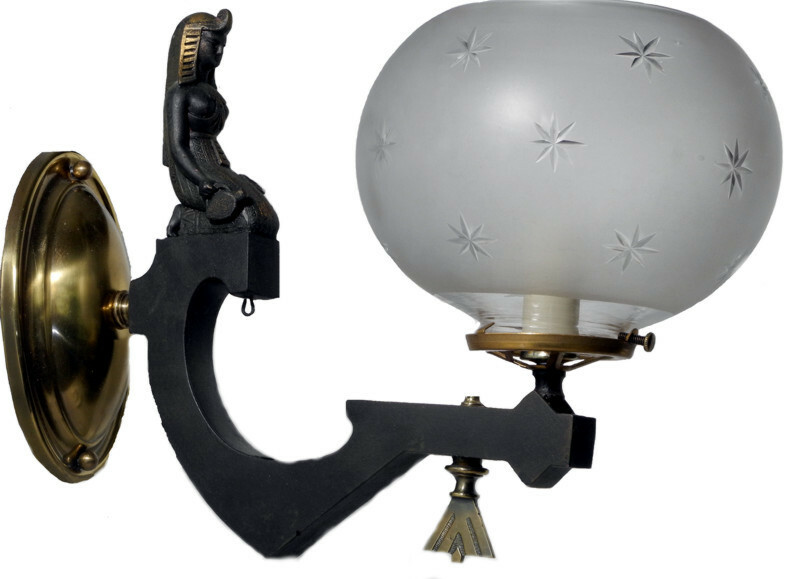 Item # GE 09111 A four arm gas/electric fixture fitted for electricity and shown with double etched Bellflower patterned Vianne shades. The drop is presently 31 inches. This can be altered to meet your needs. The spread is 27 inches. 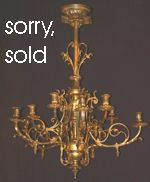 As shown the fixture is available for $1195.00 plus shipping. Questions? To order email or call. 905-885-2344. 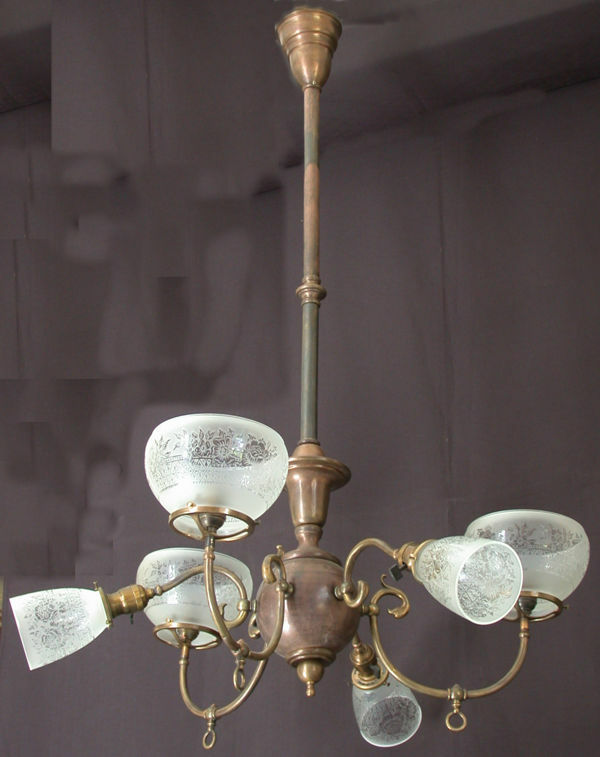 Item# GE 640 This is six light gas/electric fixture which has been fitted for electricity in all six lights. 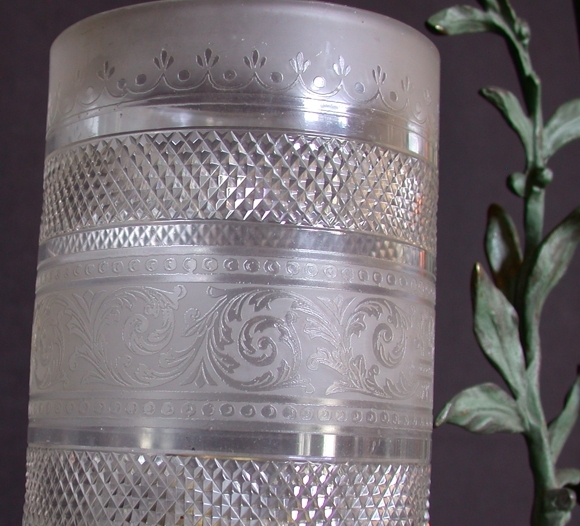 It is shown here with double etched signed Vianne shades with a wreath and torch pattern. 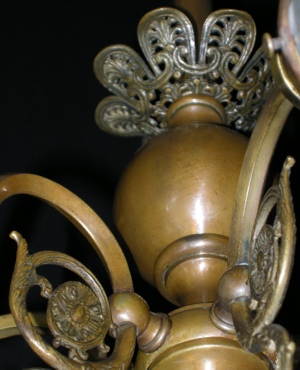 The fixture has it's original aged brass finish. The drop is 30 inches and the spread is 18 inches. As shown it is available for $995.00 plus shipping. Questions? To order email or call. 905-885-2344. 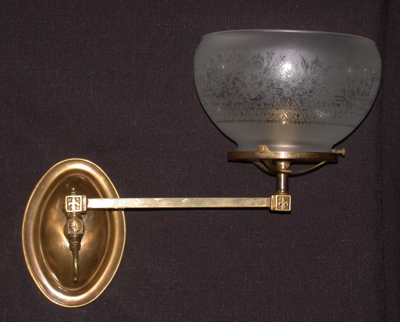 Item# G 09198 A two arm gas fixture fitted for electricity. 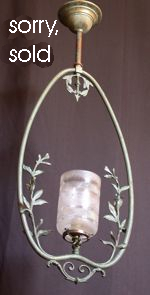 Shown with etched glass shades in a Greek Key pattern. The drop is presently, 26 inches. This can be adjusted to meet your needs. The spread is 26 inches. 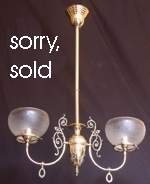 As shown it is available for $495.00 plus shipping. Questions? To order email or call. 905-885-2344. 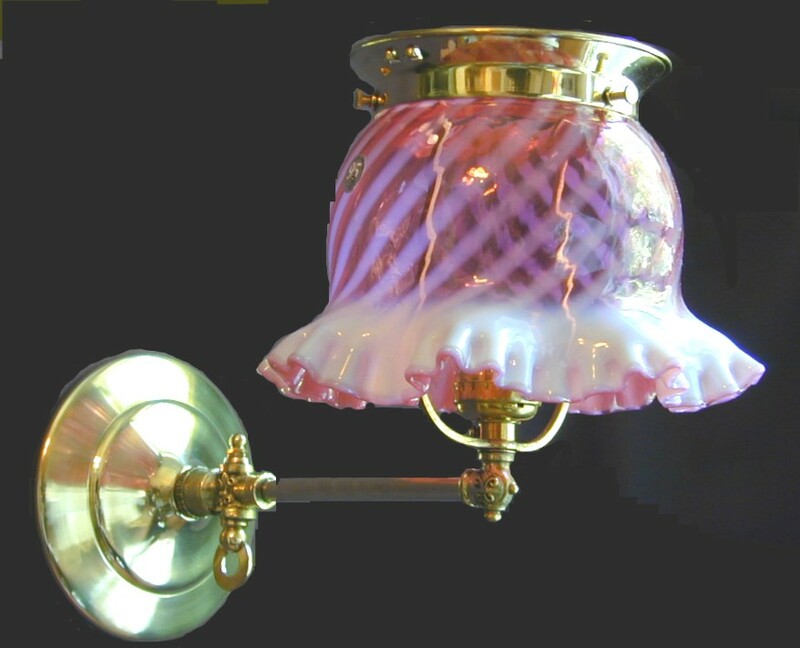 Item # SG201 This pair of 1900 converted gas sconces are shown with original inverted shade holders fitted with new Fenton swirl pattern cranberry shades. 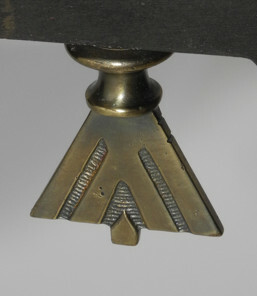 The length is 9 inches the width 8 inches and when mounted they would protrude 12 inches from the wall, as shown. 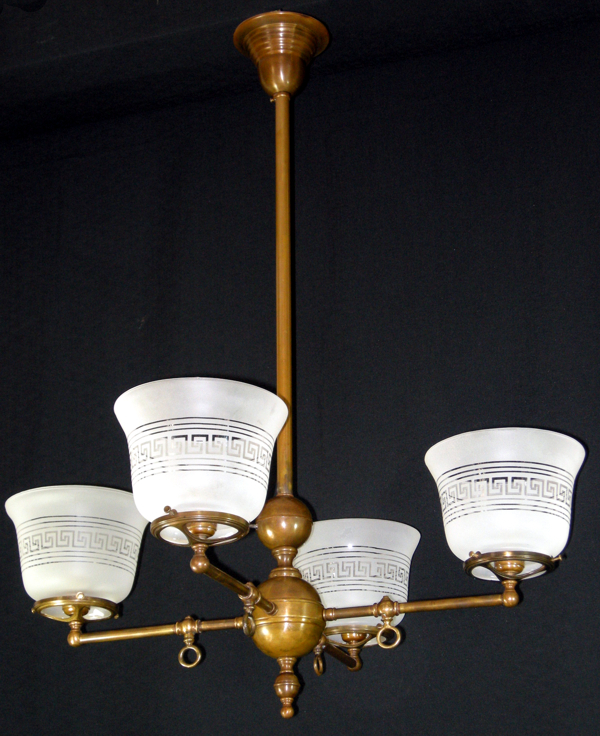 Item# G 09197 A four light gas fixture which has been fitted for electricity in a light bronze colour circa 1900. 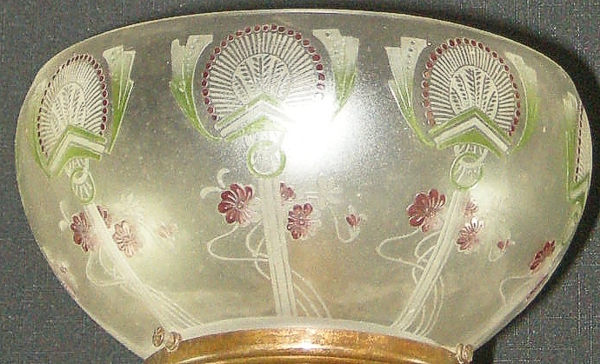 It is shown here with etched shades in a Greek Key pattern. The drop is presently 36 inches. The spread is 28 inches. Questions? To order or call. 905-885-2344. 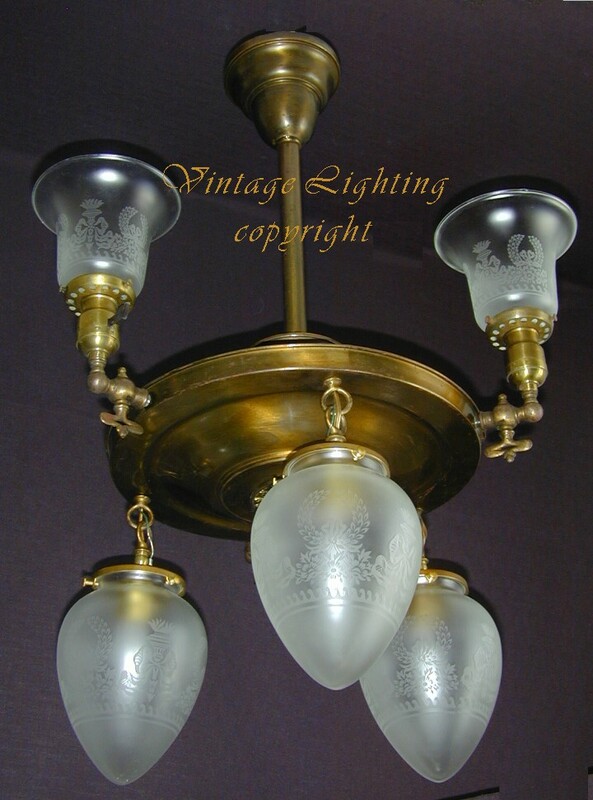 Item# GE 0986 A six arm gas/electric fixture fitted for electricity shown with transfer etched Vianne shades. 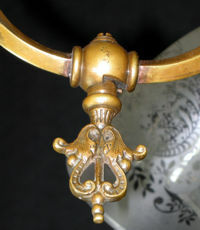 The cast brass arm backs are bird heads. The drop is presently 48 inches. This can be altered to meet your needs. The spread is 32 inches. Questions? To order email or call. 905-885-2344. 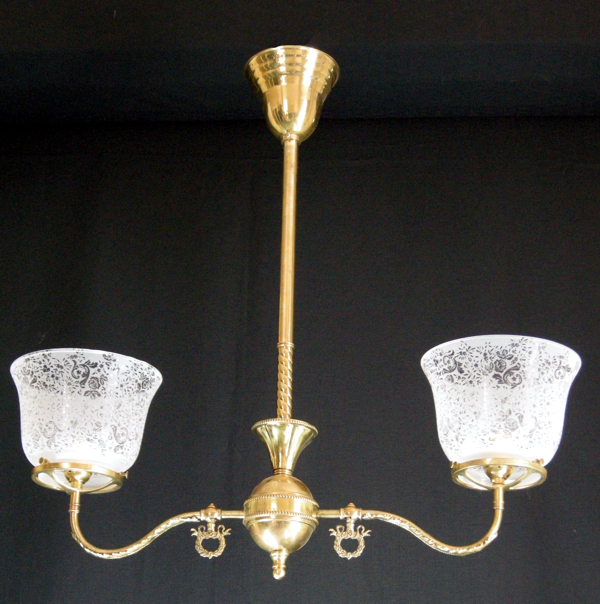 Item# GE 09196 A six arm gas/electric fixture fitted for electricity shown with transfer etched Vianne shades. The cast brass arm backs can be seen here. 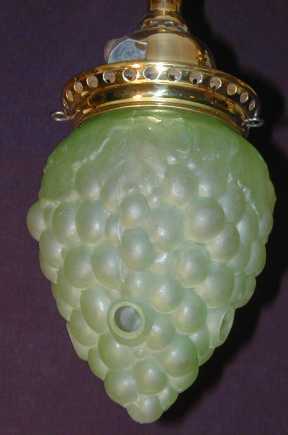 The detailed medallions on the body can be seen here. 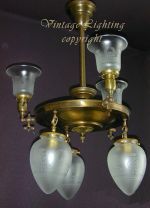 Also available are images of the pierced work, and gas valves. The drop is presently 37 inches, the spread is 25 inches. 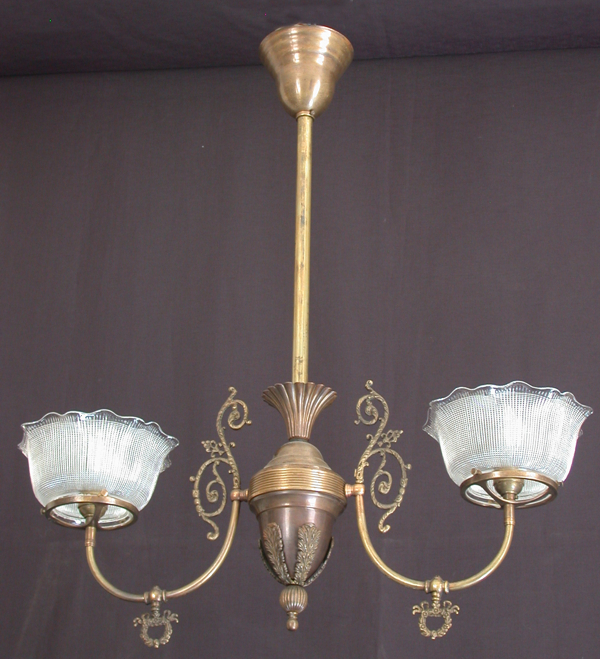 Item# GH 09211 Circa 1895 Gas harp fixture with original aged brass finish. 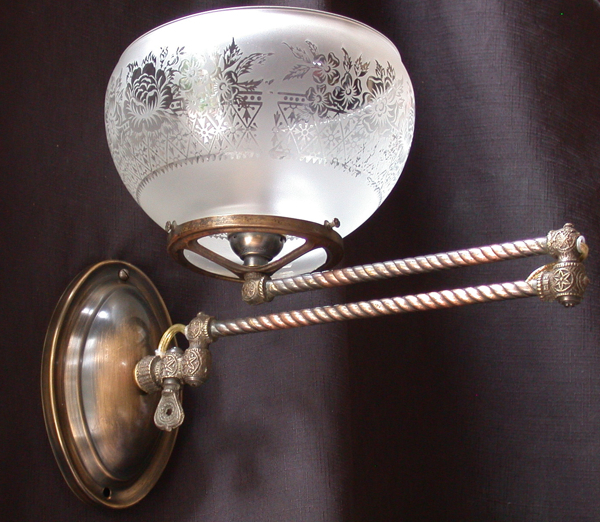 Shown with a deeply etched shade with coloured details. To view a close up image of the shade please follow this link. The drop is presently, 30 inches. The spread is 12 inches. 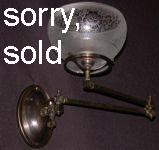 Item# G 09201 A two arm gas fixture fitted for electricity. 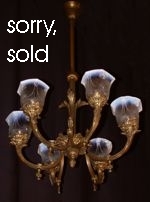 Shown with etched glass shades in an overall floral pattern. 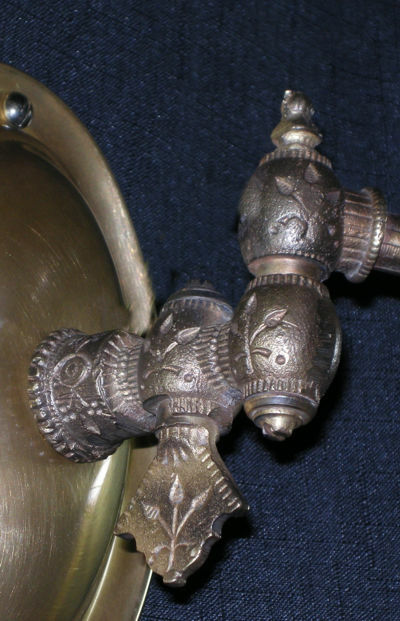 The arms are embellished with leaves and the gas valves are very elaborate. The drop is presently, 27 inches. This can be adjusted to meet your needs. The spread is 27 inches. Questions? To order email or call. 905-885-2344. 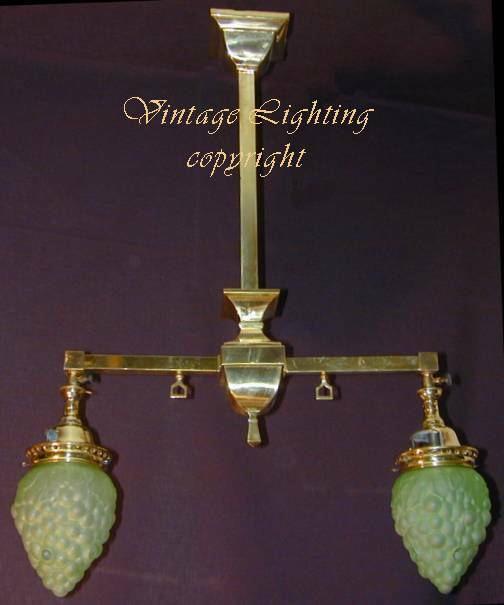 Item# G 0983 A two arm gas fixture fitted for electricity. 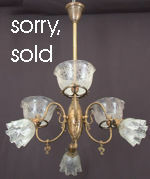 Shown with pressed glass shades in a daisy and garland pattern. The drop is presently, 27 inches. This can be adjusted to meet your needs. The spread is 26 inches. Questions? To order email or call. 905-885-2344. 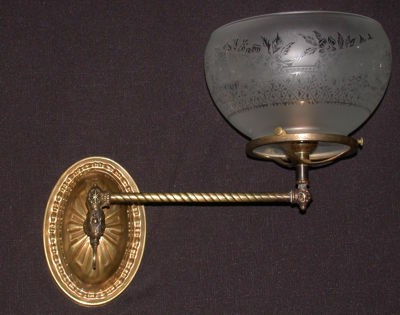 Item# G 0982 A two arm gas fixture fitted for electricity. Shown with prismatic shades. The drop is presently, 32 inches. This can be adjusted to meet your needs. The spread is 27 inches. Questions? To order email or call. 905-885-2344. 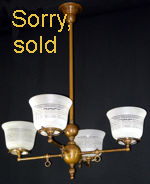 Item# GE 0985 A six arm gas/electric fixture, fitted for electricity. 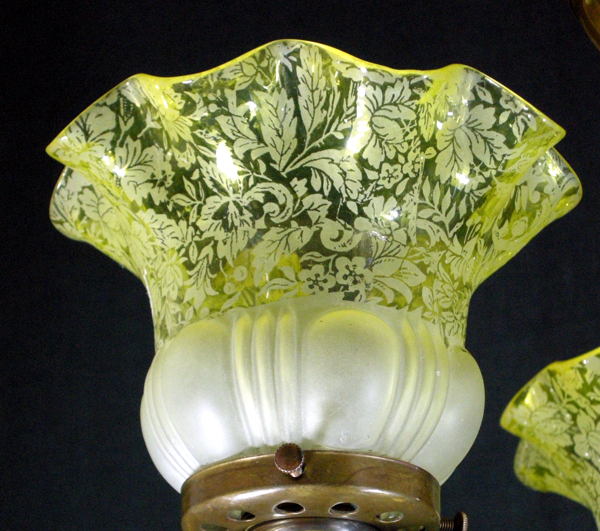 Shown with period acid etched botanical print shades circa 1900. The drop is presently 36 inches. This can be altered to meet your needs. The spread is 28 inches. Questions? To order email or call. 905-885-2344. 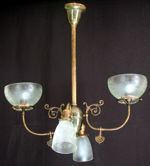 Item # G sc 11211 This pair of circa 1900 gas sconces has been fitted for electricity and is shown with acid etched shades. 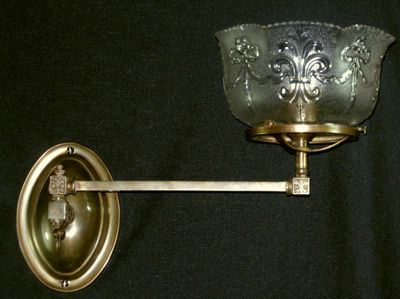 The sconce has the original period finish, aged brass. 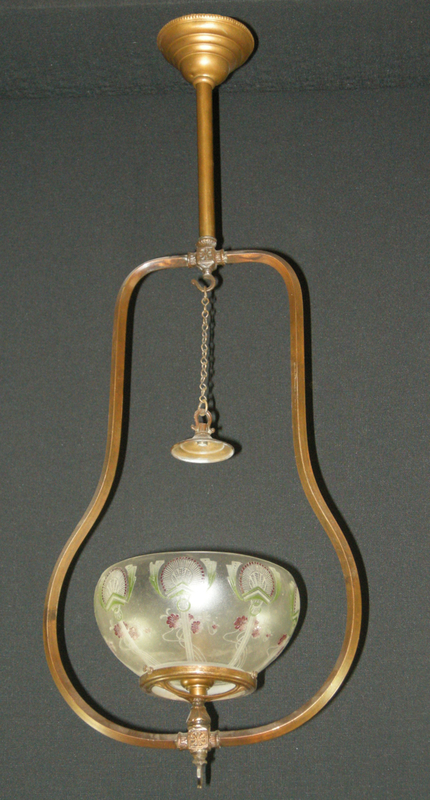 A backplate has been colour matched and added when the fixture was fitted for electricity. 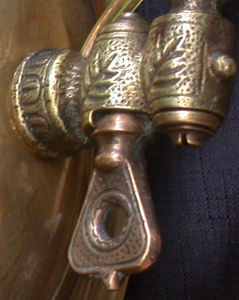 Cast brass details on the gas valve and connectors with square tubing form this pair. 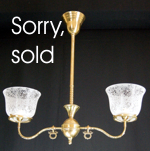 The sconces can pivot 180 degrees from left and right. 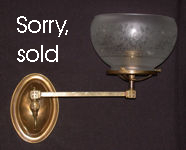 The sconce will protrude from the wall from seven inches (closed) to 15 inches (fully extended). 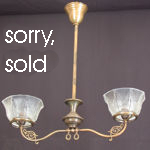 Item # G sc 11212 We have two pair, four of these, circa 1900, gas sconces fitted for electricity and shown with acid etched shades. They have the original period finish. A backplates have been colour matched and added when the fixtures were fitted for electricity. 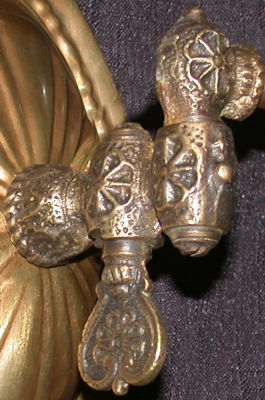 Cast brass details on the gas valves and connectors with rope twist tubing form these. The sconces can pivot 180 degrees from left and right. 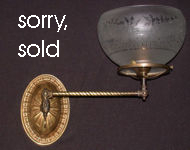 The sconce will protrude from the wall from seven inches (closed) to 15 inches (fully extended). 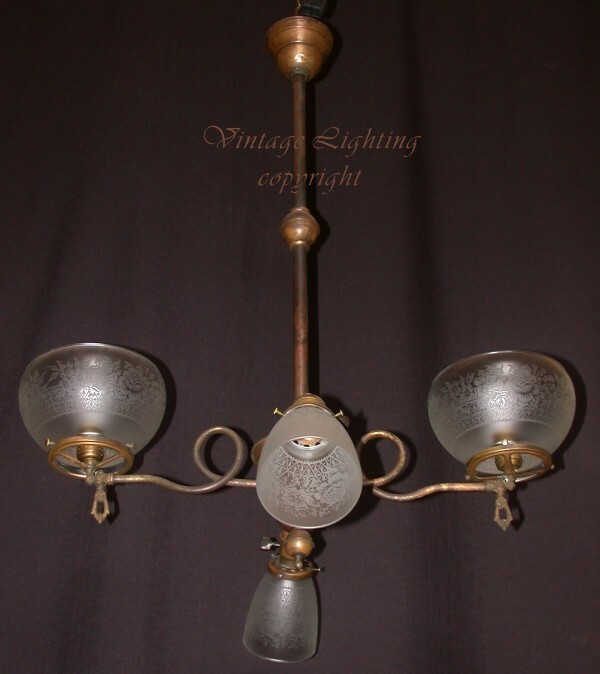 Item # G sc 09049 This pair of circa 1900 gas sconces has been fitted for electricity and is shown with acid etched shades. 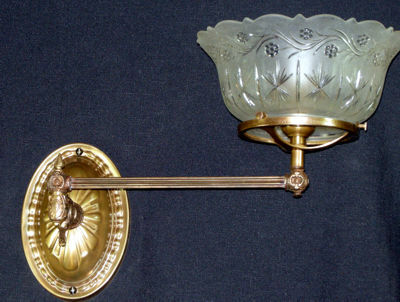 The sconce has the original period finish, aged brass. A backplate has been colour matched and added when the fixture was fitted for electricity. 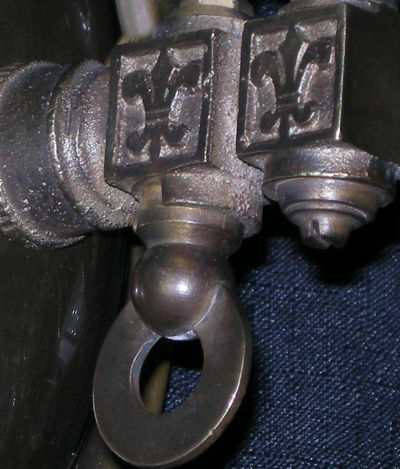 Cast brass details on the gas valve and connectors with square tubing form this pair. 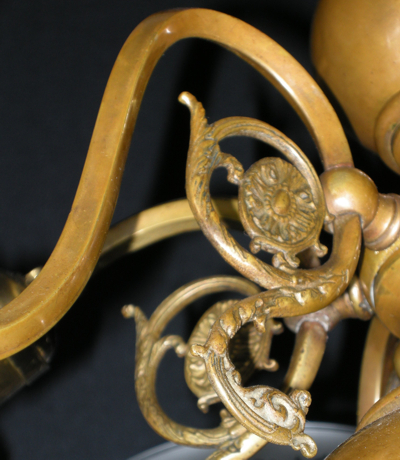 The sconces can pivot 180 degrees from left and right just above the valve and again almost 360 degrees. 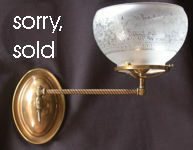 The sconce will protrude from the wall from seven inches (closed) to 26.75 inches (fully extended). The measurement from the top of the shade to the bottom of the backplate is 12 inches. 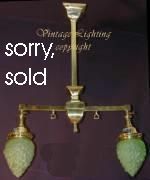 Item # G sc 02047 A pair of circa 1900, gas sconces fitted for electricity and shown with period glass shades. They have the original period finish. Backplates have been colour matched and added when the fixtures were fitted for electricity. 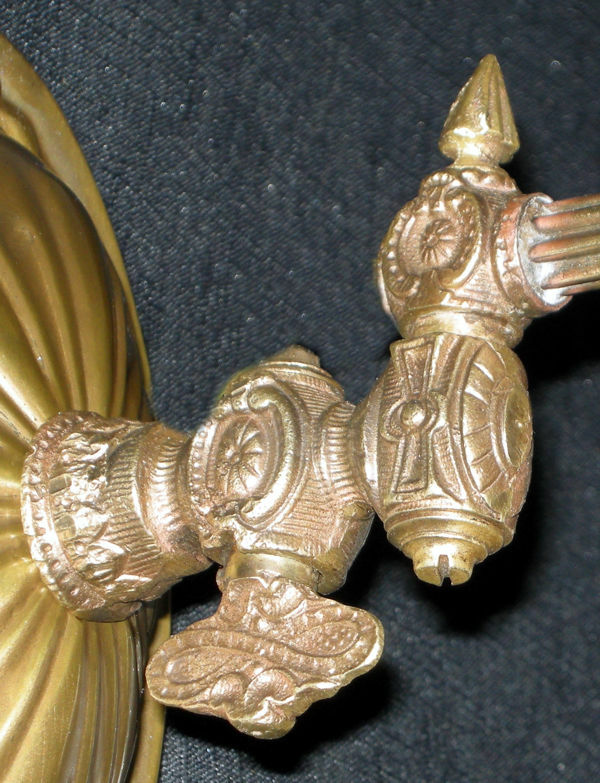 Cast brass details on the gas valves and connectors with rope twist tubing form these. The sconces can pivot 180 degrees from left and right. The sconce will protrude from the wall from eight inches (closed) to 16 inches (fully extended). Item # G sc 02049 A pair of circa 1900, gas sconces fitted for electricity and shown with period pressed glass shades. They have the original period finish. Backplates have been colour matched and added when the fixtures were fitted for electricity. 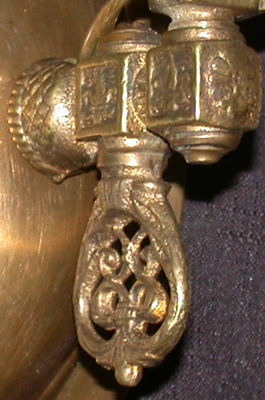 Cast brass details on the gas valves and connectors with rope twist tubing form these. 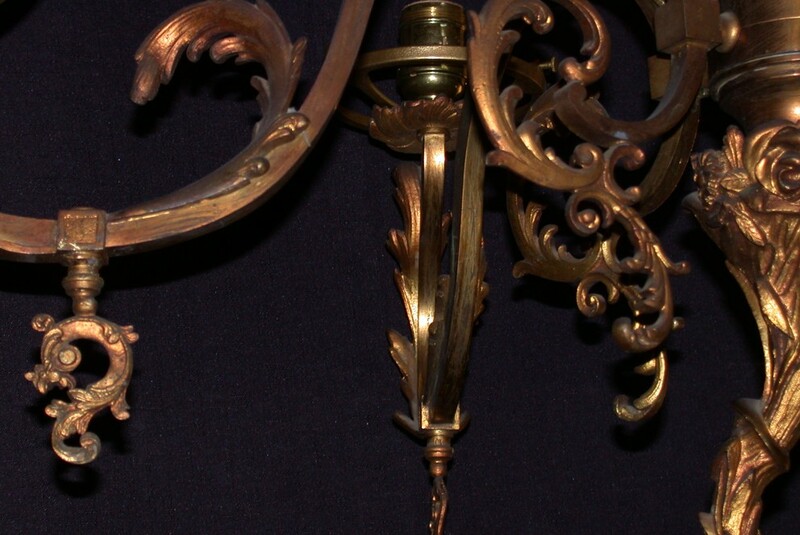 The sconces can pivot 180 degrees from left and right. 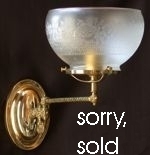 The sconce will protrude from the wall from seven inches (closed) to 16 inches (fully extended). 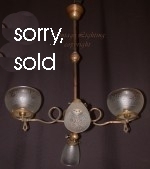 Item # GL 520 A five arm Gas fixture made in France circa 1890. 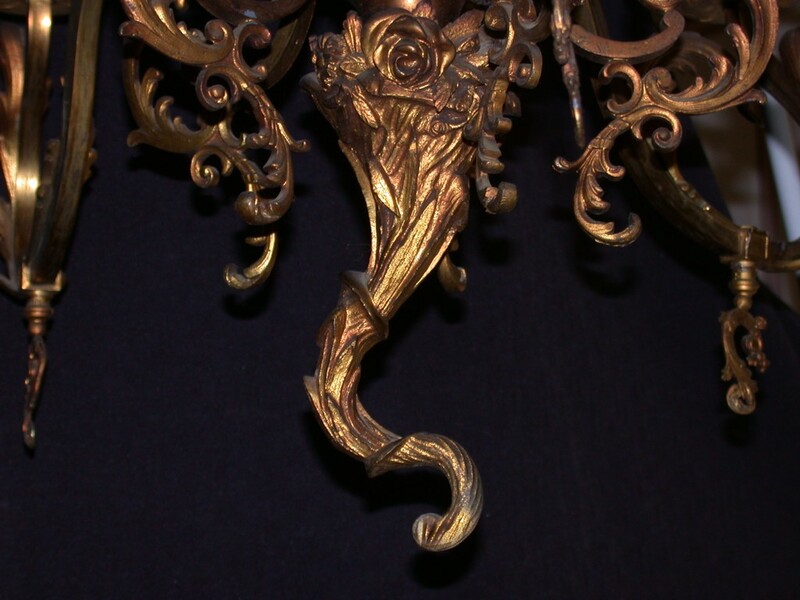 The fixture has wonderfully crisp details, a cornucopia which finishes the piece, and a putto who adorns the sinuous stem, cast leaves on the arms and foliate gas valves and bulrushes gracing the body of the fixture. 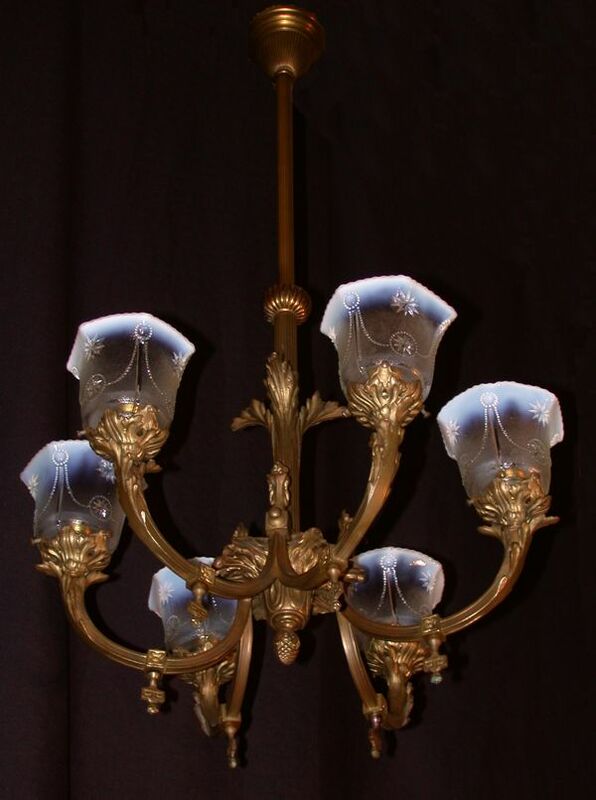 The fixture has been fitted for electricity. 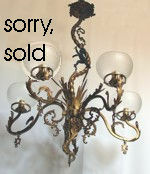 It is shown with double etched rose patterned French shades. 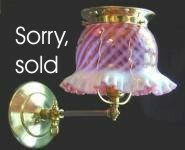 Also available is a set of five Phoenix Opalescent swirl patterned shades circa 1880. The total drop as shown is 41 inches the spread is 30 inches. 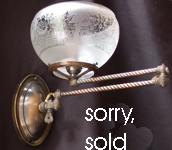 Item # GL 1001 A ten arm Gas fixture made in England circa 1880. Follow this link to view a more detailed image of the arms. It will be fitted for electricity. 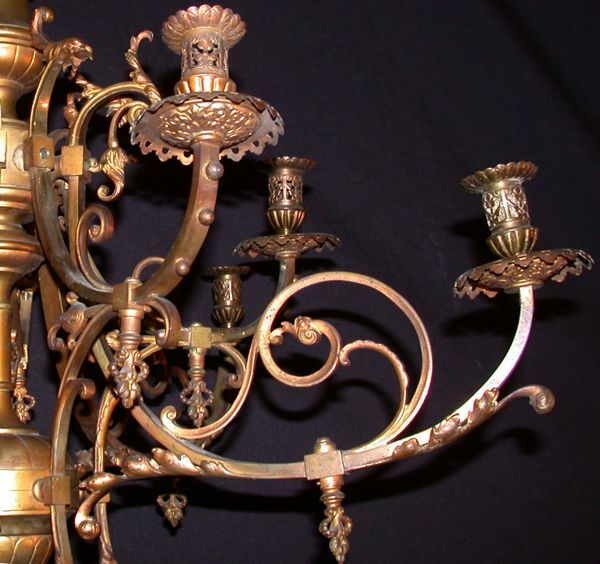 It retains the original gilt over bronze finish. The drop is 40 inches and the spread is 32 inches. 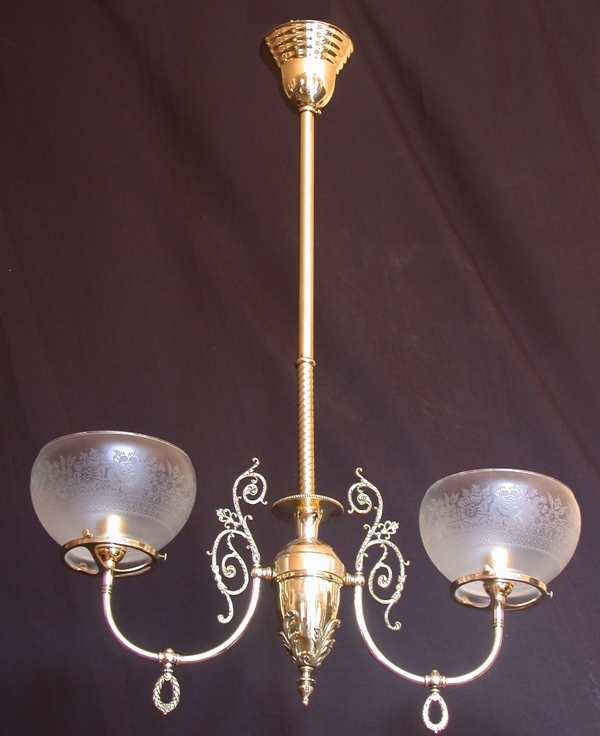 Item # G 203 This converted two light fixture has the original Welsbach burners retained. 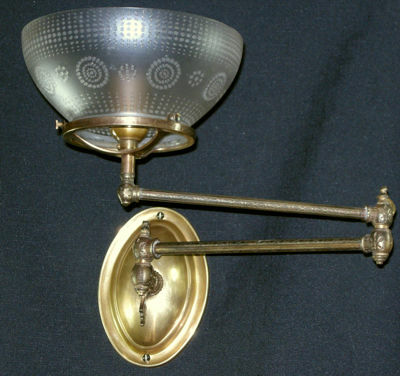 This invention in 1897 allowed gas to also make the claim that light could be directed down into the room. Before this date this was only possible with electric fixtures or angle lamps.. 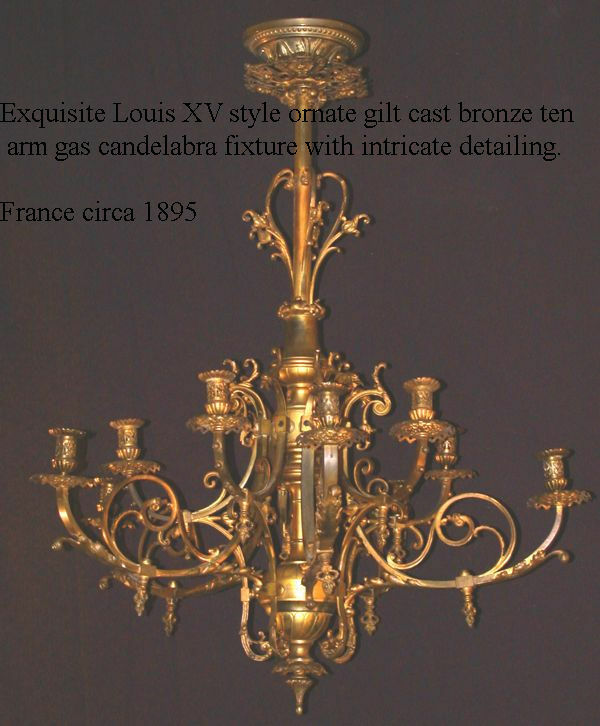 Prior to 1897 Gas fixtures were always up lights. 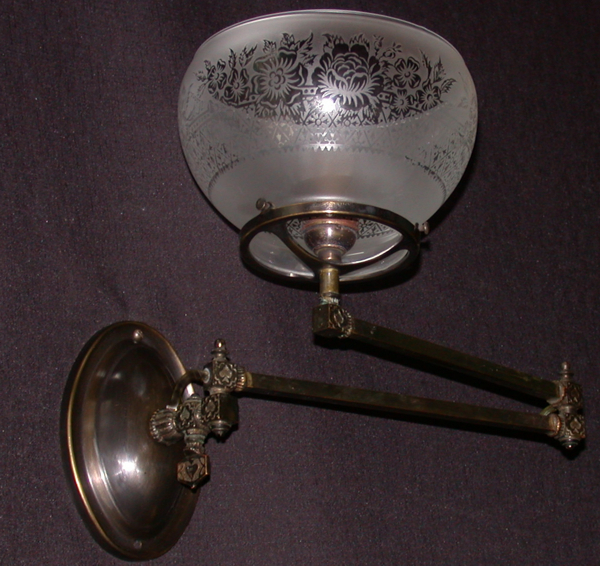 It is shown here with period shades. Other shades are available to view options just follow the links with red grapes the price would be $495 , with Vianne shades the price would be $495 plus shipping. The drop is 30 inches and the spread is 23 inches. 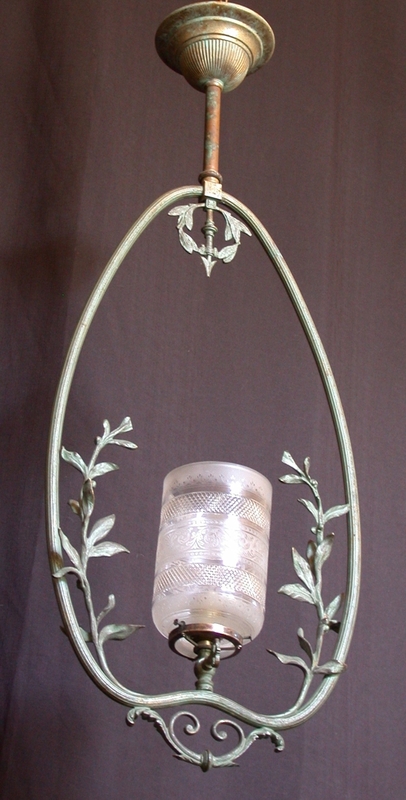 As shown this piece is available for $550.00 plus shipping . The drop can be adjusted to meet your needs. 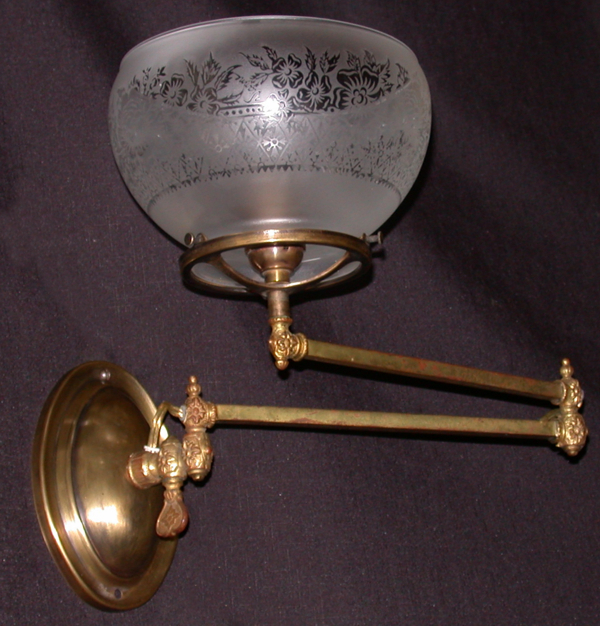 Item# GE 211 A gas/electric fixture fitted for electricity on both the gas and electric arms. 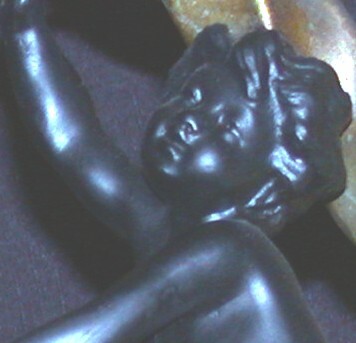 It is shown here with the original period finish. 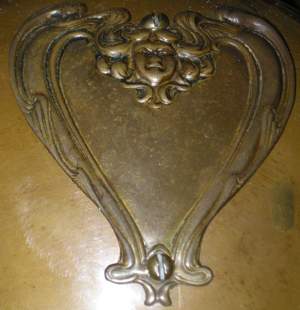 There is simple art nouveau detail on the arms. The drop is 35 inches and the spread is 27inches. 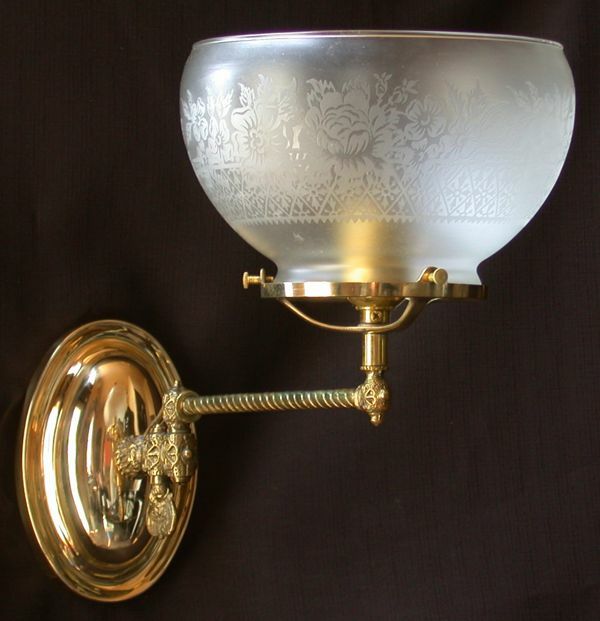 Item# G 2020 A two light gas fixture fitted for electricity and shown with signed double etched Vianne shades. The drop is 36 inches. This can be adjusted to meet your needs. The spread is 26 inches. 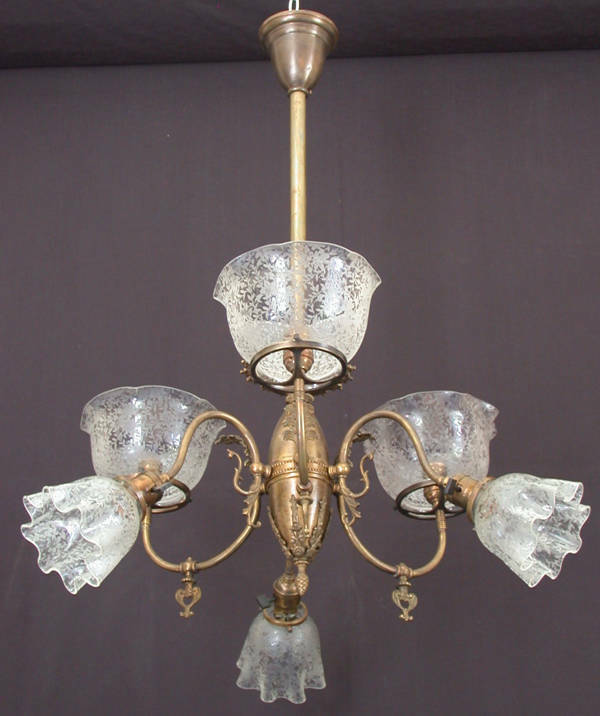 Item # GL 620 This late 19th C. six light gas fixture has been fitted for electricity and is shown here with six Star Medallion patterned, opalescent pressed glass shades made by the Imperial Glass Co c. 1910. 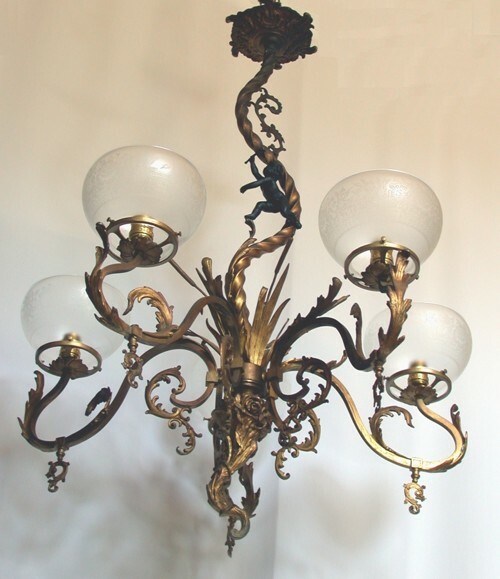 The fixture has three double branched cast brass arms which end in foliate shade holders. The drop is presently 38 inches and the spread is 23 inches.